Under the auspices of the American High School Theater Festival, the JCHS Drama company returned to the Edinburgh Festival Fringe in August 2017 to perform Alice & the Black Hole Blues, an original, student-created work devised especially for this prestigious international arts event. Conceived and directed by VPA chair, Dylan Russell, development began on a student-generated play, using the Word for Word process under the guidance of Valerie Weak in the fall of 2016. The company's premiere at JCHS May 16-18, 2017 in the JCHS Performing Arts Theater, had an enthusiastic reception from sold out audiences, before the company took it to Scotland in the summer of 2017. The Company's journey was covered by the Times of Israel and in The Jewish News UK and you can read more on The JCHS Scotland Company blog. In August 2011, JCHS Drama performed its original play The Metamorphosis at the Fringe to critical acclaim. Selected as one of the top 57 drama programs from among thousands of applicants, JCHS is the first-ever Jewish high school to perform at the festival. This play-within-a-play, adapted by JCHS students and faculty using the Word-for-Word process, re-imagines Franz Kafka’s timeless tale of a man transformed into “a vermin-unit for sacrifice” as a performance staged by the real-life World War II Jewish theater company, Nowy Teatr Kameralny, which performed Jewish plays and anti-fascist satires in the Warsaw Ghetto in defiance of Nazi bans. The JCHS actors—constantly shifting like the characters in Metamorphosis—fail to establish communication with others; their world erupts in grotesque incidents and violence, as they desperately search for meaning, identity, and a sense of purpose. For The Metamorphosis, each student crafted his or her Nowy Teatr character, drawing from personal, educational, and spiritual connections to the Holocaust. All scenes with the Nowy Teatr Kameralny were improvisational and differed among performances. Several alumni of the 2011 JCHS Drama troupe have gone on to pursue studies and subsequent careers in theater. Beth Magid '12, has directed and produced musicals for The Case Footlighters company at Case Western Reserve. Ayelet Schrek '13 was a finalist in PlayGround's 2012 Young Playwright Project for her work Roundabout, and directed shows at Brandeis University. She has also performed with the Boris' Kitchen improv troupe at Brandeis. Micah Fenner '12 has created lighting designs for the drama productions at Carnegie Mellon University. Renee Torchio MacDonald '13 completed her B.F.A. in the prestigious theater and television program at UCLA. In 2016 she had the opportunity to work with Francis Ford Coppola on a hybrid theater-film project, and is now a co-founder of a revolutionary Shakespeare theater in Los Angeles. Uriel Sudikoff '11 played the lead in Parade at University of Michigan. Jake Rosenberg '14 was also chosen as a 2013 finalist by PlayGround for Pitch Slap, and again in 2014 for Occupi. 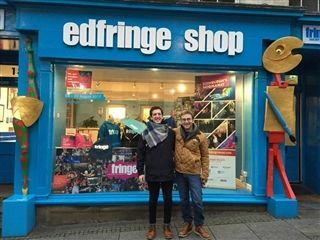 Jake, now a junior at NYU's Tisch School of the Arts, was also inspired by the trip to Edinburgh to write his comedy The Scotland Company, which was premiered by San Francisco's Thunderbird Theatre Company in 2014. Since then, Jake's plays Muse of Fire (2014) and Brothers (2015) have premiered off Off-Broadway at the Manhattan Repertory Theater, while his work No One Gives a Clap (2014) was produced in Los Angeles, Chicago, Vancouver and Frankfurt, Germany and was also named a finalist for the 2014 City Theatre National Award for Short Playwriting. The 2011 JCHS Drama Company included: Talia Beck, Faina Cherdak, Evan Fenner, Micah Fenner, Noah Goldstein, Ethan Hall, Aviva Herr-Welber, Sophie Kreeger, Renee Torchio MacDonald, Beth Magid, Sophie Marinoff, Yael Platt, Jake Rosenberg, Ayelet Schrek, Uriel Sudikoff, Nathan Wexler, Sophia Wilkof. Performing in Edinburgh was a formative and thrilling experience for me. The opportunity to perform a play I helped create on a professional and international stage built me up as an artist and set me up for future theatrical forays. Now, on the verge of graduating from college and entering the world of professional theatre, I look back at our Scotland trip as the experience that showed me what was possible. What I loved the most about the JCHS trip to Scotland was that we did everything as a group. We created our own version of the script, we did all the fundraising and walked up and down the Royal Mile rallying people to come see our performance. It was a lot of fun and it really brought us all together. Read what Jake Rosenberg '14 had to say to the 2017 Scotland Company. "...The Fringe really did decide the direction of our lives and we had no idea at the time..."